In recent times, many folks have asked us the secret sauce for planting a lot of trees in a short period. If there is a secret, it has to be in those trenches! Not all farms require trenching though. The decision to dig and the pattern in which they are dug depends on the contour of the farm land, water supply and irrigation method. Our farm is located in a hot, tropical region (south India) with unpredictable rainfall. So we decided to have trenches and trees (in those trenches) as the main infrastructure. Digging trenches in the farm serves multiple purposes. They serve as rain water harvesting pits, prevent wind from carrying away moisture, allow only partial sunlight to enter (and hence protect the seeds and saplings planted in them), prevent soil erosion from rain, serve as compost areas and a safe place for drip tubes and create a design pattern for other crops to be planted in between. In pictures: Trenches then and now. Our farm is sort of rectangular in shape with a longer north-south. The land slopes from south to north. We dug 2ft wide and 1.5ft deep trenches east to west ever twenty five feet. 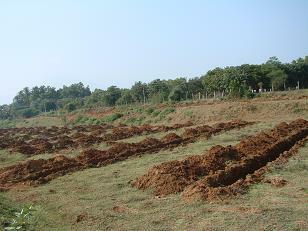 And we planted around 8500 trees in those trenches. We do drip irrigation in the trenches. All other crops will be grown in the 25 ft distance between two trenches. If all goes well, yields from the trees planted in the trenches alone will serve well for the next 60 years. So you could call our farm primarily a trench-farm! If your farm is in a moderate climate, gets good rainfall, has ample water in the well and is a flat land without much slope or ups and downs, then trenching may not be necessary. We used the monstrous JCB digger to dig the trenches because we haven’t cultivated enough patience to do it manually and we started in a season when laborers were busy elsewhere. In case you have enough time and patience (and readily available labour), do consider manually digging the trenches. The slow pace will give ample time to design the farm and plan all activities peacefully (and prevent many mistakes). It will also help local workers earn a living, get familiar with you and perhaps become regular workers in your farm. If you are going use a JCB, try to work out a contract so that you pay for the work and not for the time. Most JCB owners charge their clients by the hour (it is Rs.600/hour in our region). But in our experience, paying by the hour is not really cost effective if the driver has a bad day or more than one driver is employed. You could observe the time it takes to dig one full length of trench example). And yes, supply the driver with plenty of fluids (coconut water is great) and buy his lunch too. A good driver can do 7 to 8 hours of work without feeling tired. If your farm land has a slope, put the mud dug out of the trench on the down-side of the trench so that in case there is flooding due to rain the mud does not fall back into the trench. Before planting in the trenches, put back some top soil dug out of the trenches. If you are drip irrigating the trenches, put the lateral tube that carries that water on top of the mulching making it easier to monitor water flow from each drip hole. If you cannot find mulching material, you can go with live mulching. 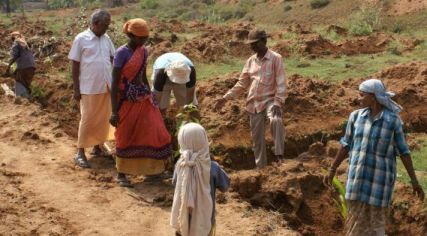 For this, lossen the top soil, throw a dense mix of seeds of fast growing plants (like Millets, Sunhemp, Corn, Gingely) in the trench and mix up the soil so the seeds are slightly buried. This can be done at the same time as planting the saplings and will create live mulching within a week. Depending on your soil, you can select those plants that control acidity or alkalinity of top soil for live mulching. Our soil is pretty alkaline so we threw a lot of Sunhemp into the mix. Also some places have strong seasons so it is good to give these seeds a coating of fine/sievedsoil, cow dung and/or ash. This coating will preserve the seeds and help them spring up when the season is just right for each species.